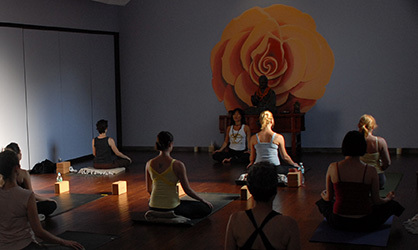 We offer Vinyasa Yoga classes and Vinyasa Flow classes. Vinyasa Yoga classes are slower moving and offer a less vigorous flow between poses but an equal challenge of endurance, flexibility and strength to our Vinyasa Flow classes. Vinyasa Flow classes are faster moving classes, you will move with music from one pose to another. Equally challenging, but different. We have a wide variety of teachers, to get more info about what to expect in their classes, please read their bio. Hot Yoga is a form of Hatha Yoga conducted in a room heated to approximately 105 degrees and kept at roughly 40% humidity. Either 90, 75, or 60 minute class will work every muscle, tendon, ligament and joint in the body throughout the 26 postures. All levels are welcome! Drink lot of water to hydrate before the class. If you have to eat before the class, make sure that any heavy meal is at least 3 hours before the class. A powerful blend of the healing postures of Hot Yoga with the strengthening flow of Heated Vinyasa. This class balances the entire body by strengthening, opening and flushing all the anatomical systems. The sequence is thoughtfully designed for all levels and with continued practice promises to become a moving meditation. The postures have no end nor does the perfect, ultimate posture exist. Hot Yoga Flow is a yoga practice students can evolve and enjoy throughout their lifetime. 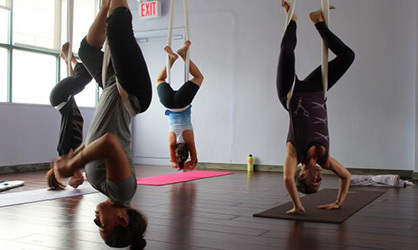 Aerial Yoga explores what happens when you combine classical asanas with elements of aerial acrobatics. You do not need to be a circus star, lifelong yogi, or natural-born acrobat to come play! Students of all levels can learn to flip, fly, and flow through Aerial Yoga sequences. After this class you will feel taller, stronger, and totally loosened up! Come elevate your spirit and “hang loose” with us!” Expect to reach new heights and have fun while doing it! Based on the principles of B.K.S. Iyengar, this class emphasizes attention to detail and precise alignment of postures. Poses are held longer and the use of props is encouraged to modify poses, if needed. Highly therapeutic, this technique helps to refine your poses while it trains the mind to remain alert, focused and composed. This class is appropriate for students of all ages and levels of practice; it is also helpful for those working with injuries or sensitivities as well as for anyone feeling a little ‘stressed out’. Yin yoga traditionally incorporates familiar poses from Hatha yoga that are used to cool the body and deepen the breath. These poses are held anywhere from 3 – 5 minutes and while there is slight tension in certain muscle groups, the focus of these poses is to bring our focus to opening the hips, creating better circulation, releasing stored emotion and unease, as well as restoring the connective tissue to its natural state all by using breath and body awareness. Restorative yoga helps balance the sympathetic (fight or flight) and the parasympathetic (rest and digest) nervous systems through fully supported poses that allow each student to deeply relax the muscles of the body, while quieting the mind by focusing on the breath. Each restorative pose is held anywhere from 1 – 20 minutes encouraging students to ‘let go’ of any chronic tension and anxiety.